This post is not “New Horizons Reaches Pluto – Part 2” as I had optimistically scheduled last week. New Horizons makes its closest approach tomorrow at 1149 UT, and though I was hoping for some early images, few have come in. Looks like we’ll have to wait awhile. New Horizons has to process its fly-by images before sending. Then it takes the radioed data close to 5 hours (traveling at the speed of light) to get back to Earth. And that data will be trickling in at a feeble 1 kbps (kilobits per second) because of the low signal strength at that distance. Patience, Earthling. Instead, I have an interesting 3-image slideshow for you. Click on the arrows to advance or rewind. 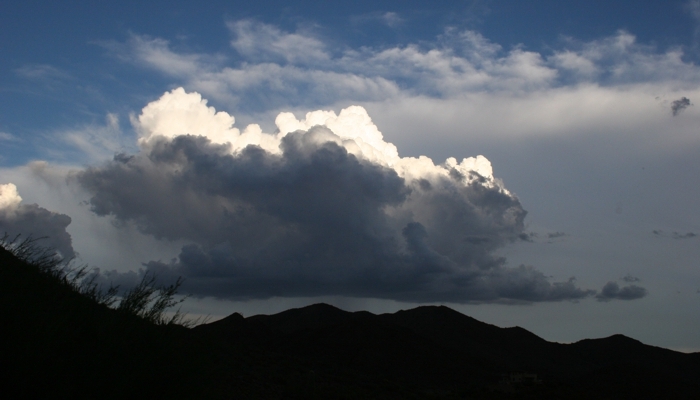 A few days ago, during one of our typical monsoon storms, I saw a huge cumulus cloud building up over east Phoenix. The top of that cloud probably reached over 10,000 meters (30,000 feet). In and of itself, nothing atypical. The interesting thing is this was right around sunset. So as the Sun dropped below the horizon, the shadow of the Earth could be seen climbing higher up that cloud. 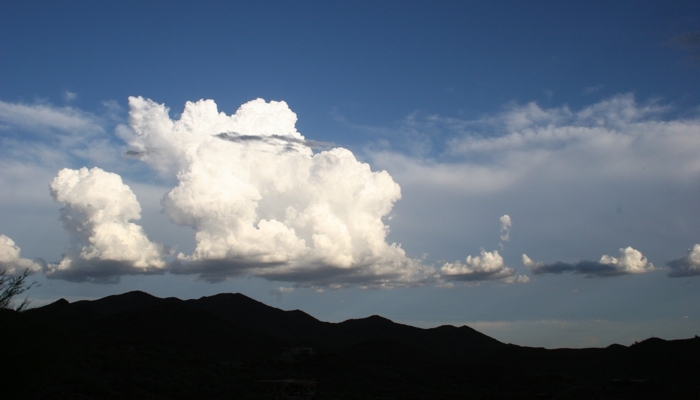 The 3 images in the slide show are separated by about 10 minutes each, so the cloud changes shape during this process, but the rising shadow of Earth is clearly visible. 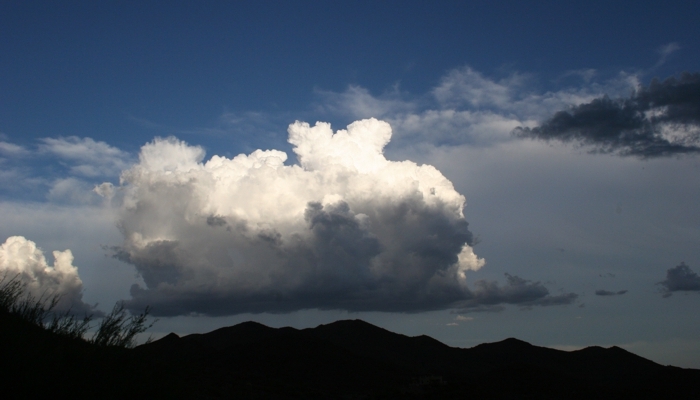 The effect can also be seen on the cloud in the background, but it’s not as obvious. Surprisingly, Earth’s rising shadow can also be seen against clear sky — if you make a point of looking for it. The casual observer might think it’s just the sky getting dark after sunset, and of course that also happens, but there’s a sharper delineation where Earth’s shadow falls. You can see a great photo of that here. The best view is during the first hour after sunset, during twilight. Also seen in that photo (but not in my slideshow) is a beautiful pastel pinkish band above the shadow. This effect is known as The Belt of Venus, and is related to what is called the “false sunset” or “anti-twilight arch.” The glow is caused by large dust particles and/or micro-droplets of suspended water that back-scatter the reddish rays of the setting Sun. The same effects are visible just before sunrise, but fewer people are up at that hour. So the next time you’re watching a sunset, turn around and look toward the east. The view in that direction can also be enlightening.